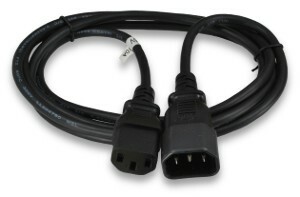 These IEC extension cords feature an IEC Male connector on one end and an IEC Female connector on the other. They are useful as power extenders for computers, monitors, and other electrical equipment which uses the common IEC power connector (pictured above). Keep a few of these handy cables around for when you are in a tight spot. These power coards are constructed from 18AWG wire.